Frequency Painting is the overarching title for a body of visual work arising from a series of research and production residencies at The Banff Centre 2009-2011. The series is continuing to evolve and expand from Joynes’ Edmonton studio to this day. The works have been generously supported by Edmonton Arts Council (EAC), Alberta Foundation for the Arts, and Canada Council for the Arts. To date there have been five chapters in the Frequency Painting tale. The Topographic Sound series explores sound as a powerful force akin to the unstoppable impact of time and nature in the formations of geology. Six very large photo-based works can be seen as graphic scores of the musician manipulating sand and sound, or as evidence of the effects of nature and vibration on a microscopic scale as it is related to the effects of much larger vibrations – earth movements and solar rotation. Soundbursting No. 1, a 2-channel HD video projection and generative audio composition debuted in Edmonton’s Harcourt House in March 2012. 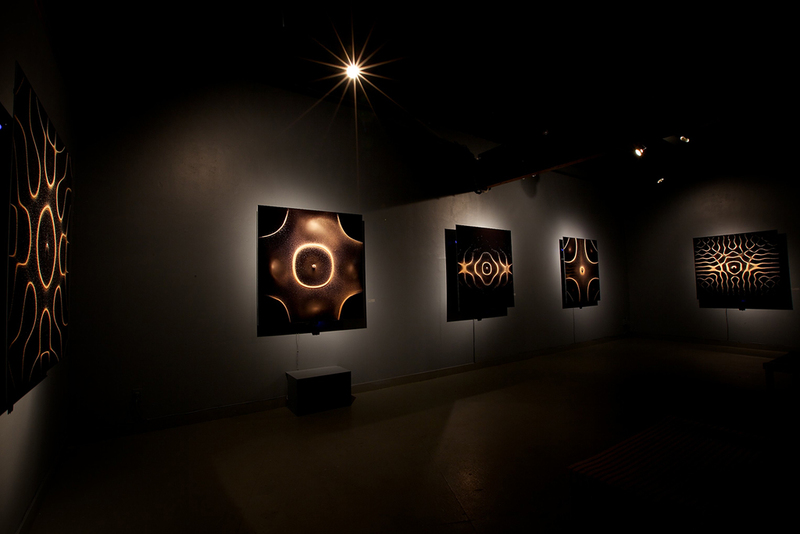 Ouroboros, which premiered in an international group show at the Koffler Centre in Toronto September 2011, is a mixed media installation based on five high-frequency pure tones whose physical resonant patterns form complex mandala forms. A complex mosaic of 9 C-print photographs of these patterns, forming a larger mandala, is hung near a looping single channel 1080p HD video of these same tones arising from and disappearing into chaos one by one. As video tones shift, so too does the artist composed soundscape built with the high pitched pure tone layered with multiple tracks of the artist’s sung harmonized/layered voice. 12 Tones is a 12-channel sound composition using pure frequencies of changing volumes to create a generative sound composition played by twelve sculptural wall pieces – photograph, sound generating unit and custom programmed sonar unit – in a room filling suite of binaural beating and haromonic sound play. This piece premiered at Edmonton’s Latitude 53 January 2011 and is currently being proposed for shows in other major centres. Wavedrifting is an ongoing series of animated single channel short film works produced by analog synthesizer programming (cross modulation and FM) presented as video installation and live performance.